Why does Teflon stick to the metal pan but not food? 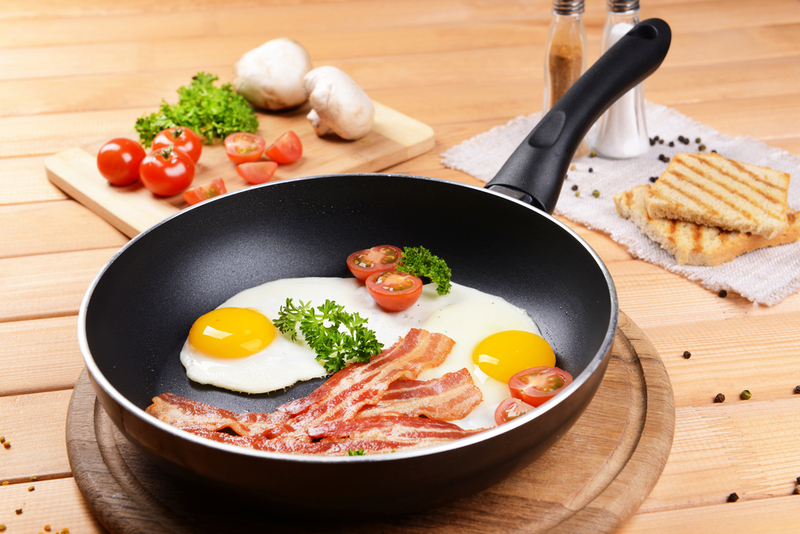 Why does Teflon stick to the metal pan but not your food? One of the many things we love about science is how an accidental discovery — like penicillin — can yield fantastic, world-changing results. Teflon is another example of a time when science seized victory from the jaws of error. Granted, it may never save your life, but it can sure save your bacon when you burn your morning omelet to a charred, smoking heap. Do that in a metal or cast iron pan, and you’ll be soaking and scraping for hours. Burn food in a pan coated with a non-stick surface, such as the trademarked Teflon, and cleanup is a simple matter of sliding the ruined meal in the trash. We have Roy J. Plunkett, a DuPont scientist who was studying refrigerants in the 1930s, to thank for that. Plunkett accidentally discovered the polymer that would become the basis of Teflon when he stored some frozen tetrafluoroethylene gas (TFE) in small cylinders, intending to chlorinate it. The TFE spontaneously polymerized into polytetrafluroethylene (PTFE), with fluorine atoms melded in a super-tight chain around carbon atoms. Fluorine naturally repels other elements, which is why burnt food doesn’t stick to the inside of your non-stick cookware. In fact, pretty much nothing can stick to PTFE, not even the super-sticky feet of a gecko. How, then, is it possible for the Teflon coating to stick to the inside of the metal pan? One method involves sandblasting the pan to create an uneven surface, spraying a coat of the polymer on the roughed-up pan interior, then super-heating the whole thing until the polymer layer gets a firm mechanical grip on the metal pan. The process may involve multiple layers and multiple bakings to achieve the final non-stick pan. Another method uses ions to break apart some of the bonds between the fluorine and carbon atoms, which allows the carbon to bond to the metal pan. A reducing agent may also be used to break the fluorine-carbon bonds. Teflon is a trademark of DuPont, but not all non-stick cookware is made with DuPont’s product. Sometimes, a cookware manufacturer’s non-stick polymer might not be behaving as they intend, and they may turn to coating analysis to help them understand why. For example, perhaps the coating is uneven or not the correct thickness. A microscopy analysis of sample cross-sections can help us understand the dimensions of the coating and any variances. Maybe the coating isn’t sticking to the underlying material. We can use chemical analysis and microscopy to detect anything that might be interfering with the surface adhesion. Not all scientific accidents are as happy as the original discovery of PTFE. 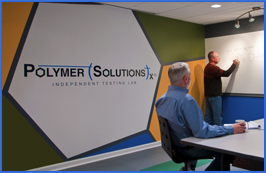 When something goes awry in a polymer coating’s performance, we can use a variety of polymer testing methods, including coating analysis, to find out what’s going on. Unfortunately, while science is zeroing in on just how geckos manage to stick to everything except Teflon, you’re still on your own when it comes to figuring out how to improve your cooking skills. Thanks for leaving feedback. The aim of this article was to explain the function of coatings and the science behind non-stick coatings–arguably the most well known is Teflon. We like to answer questions pertaining to science that is encountered in everyday living, which was the intent of this blog post. We certainly agree that within any chemical testing or manufacturing process the utmost of care should be taken to ensure environmental safety, safety to those in and around the facility, and at all times ethical practices. There are some specialists suggesting that Teflon might be harmful to people’s health in the long term. I’d rather use a stainless steel pan. Thank you for reading our blog and leaving feedback. The goal of this article, and many posts on PSI’s blog, is to inform people about everyday science happening around them. In this case, Teflon is a well-known example of a non-stick coating, and our aim was to explain the science behind this. We agree that safety, for people and the environment, is always something to take into consideration when using a product.